Eighty years ago, on the 12th of July, 1937, Picasso's "Guernica" was exposed to the public for the first time. To commemorate this historical event, Instituto Cervantes, the cultural center of the Embassy of Spain, in collaboration with FDCP and Ayala Museum, has programmed a film series and a lecture associated to the famous painting and the historical period when it was created. On April 26, 1937, the German aviation bombarded the Basque town of Guernica. Moved by the tragic event that caused many civilian casualties, Picasso, who had been commissioned by the government of the Republic to produce a painting for the Spanish Pavilion at the 1937 Paris International Exposition, decided to name his work after the Basque town. A masterpiece of 20th century painting, Guernica was exposed to the public for the first time on July 12, 1937. Presented by Instituto Cervantes, the Embassy of Spain and the FDCP, the film series “Spain in the times of Picasso's Guernica” aims to offer a cinematic vision of the turbulent history of that decade. The cycle will be held every Saturday of July at 6pm at the FDCP Cinematheque (855 T.M. Kalaw, Ermita, Manila). The cycle will kick off on July 1 with the feature film El viaje de Carol (Carol’s Journey). Carol is a twelve-year-old Spanish-American girl from New York who travels to Spain with her mother in the spring of 1938. Carol arrives in her mother's home village and transforms the secretive family environment. Her innocence and rebellious nature make her reject a war-stricken world that is new to her. 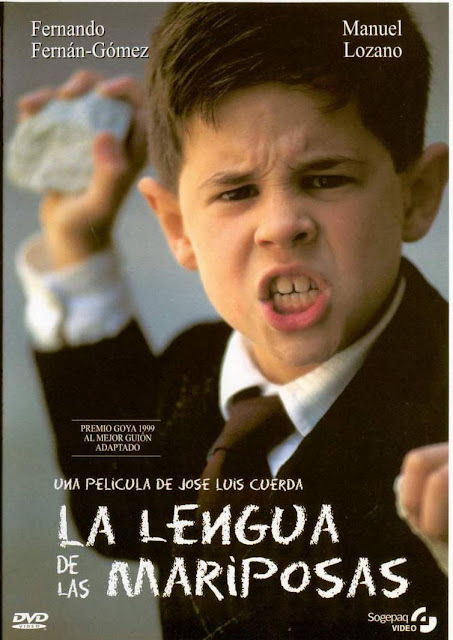 The film series will continue on July 8, 6pm, with the viewing of La lengua de las mariposas (Butterfly's Tongue), directed by José Luis Cuerda in 1999. The film, based on several short stories written by the Galician author Manuel Rivas, is set in Spain in 1936. 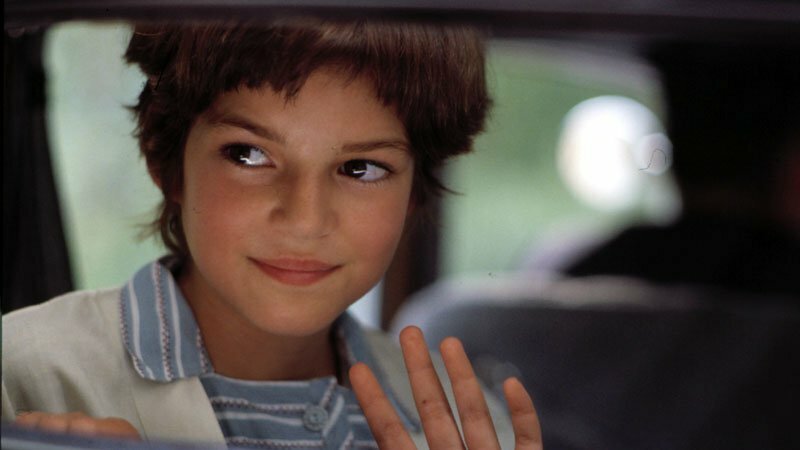 It explores the relationship between a young boy and his incredibly compassionate teacher, who teaches the kid to find his way in a world that is increasingly frightening. La lengua de las mariposas bagged more than twenty international awards and nominations –among them, the Goya Award to the Best Screenplay. The following Saturday, July 15, at 6 pm, the documentary Raza, el espíritu de Franco (Race, the Spirit of Franco) will be featured. Directed by Gonzalo Herralde in 1977, this documentary produced after the dictator Francisco Franco's death, includes interviews with the dictator's sister and the actor who played the leading role in the Franco-inspired film Raza. On July 22, 6 pm, the audience will have the opportunity to see a short documentary that has become a classic – Luis Buñuel’s Tierra sin pan (Land Without Bread). Produced in 1933, the film recounts Buñuel’s journey to Las Hurdes, a remote region in Extremadura, which was connected to the outside world only in 1922 with the completion of a road. The residents of the area - spread across several villages – had to endure miserable lives in poverty and isolation from the outside world. The program for the day will be completed by the feature film Alsasua 1936, directed by Helena Taberna in 1994. Directed by Pilar Pérez in 2013, the documentary Las maestras de la República will conclude the movie series on July 29 at 6pm. 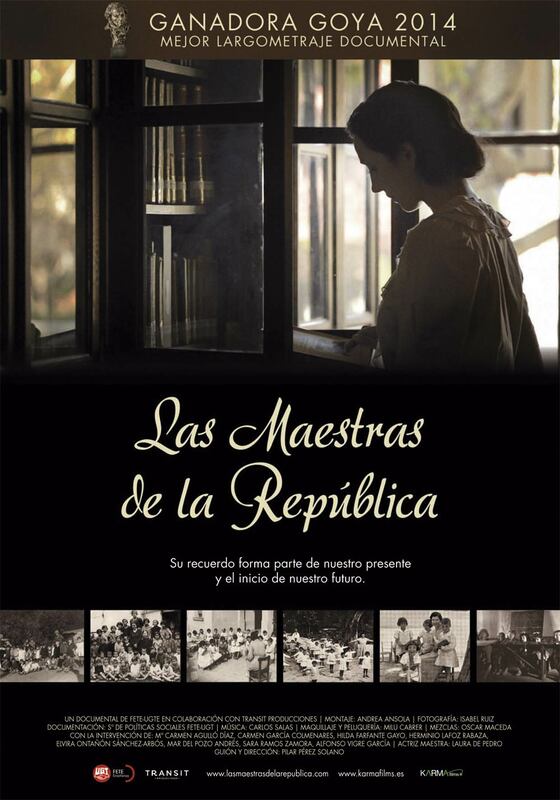 This film, awarded with the Goya for Best Documentary in 2014, reflects the role of several female teachers, their effort to establish democracy in the country, and how they were key in the years between 1931 and 1936. 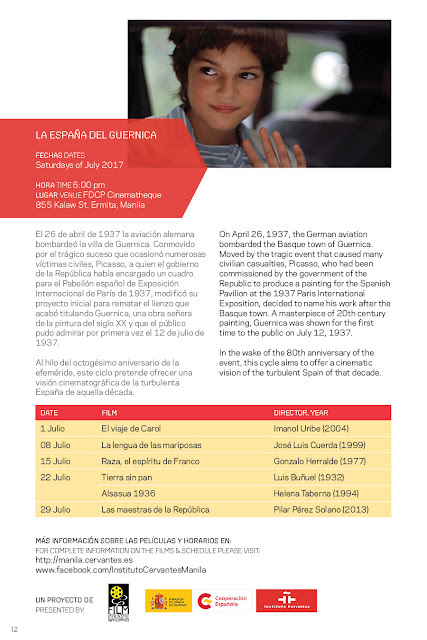 All films will be shown in their original versions in Spanish with subtitles in English. The screenings will take place at the FDCP Cinematheque, 855 T.M. Kalaw, Ermita, Manila. Entrance is free on a first-come, first-served basis. Alternatively, on the 8th July at 3pm, Instituto Cervantes in collaboration with the Ayala Museum, will be presenting an “Art Appreciation” lecture on Pablo Ruiz Picasso entitled “Cubism and the long Path to Picasso’s Guernica.” In this lecture, art-historian Juan Ignacio Pita will discuss some details of the historical and artistic journey that led to one of the 20th century's masterpieces. For reservations or further inquiries about this lecture, please call Ayala Museum at 759 82 88, local 8272 / 8267, or emaileducation@ayalamuseum.org. For further information on the film series and the lecture please log on to: Instituto Cervantes’ website www.manila.cervantes.es or www.facebook.com/InstitutoCervantesManila, or call 526-1482.